Known as the Siegestor, the Victory Gate is a triumphal arch in the city of Munich, Bavaria, Germany which features three arches and is topped by a lion quadriga. It was reconstructed after sustaining severe damage in 1945 at the end of World War Two. Originally completed in 1852, the Siegestor, translated to Victory Gate, was reconstructed after the second world war. The triumphal arch is located in the city of Munich in the state of Bavaria, Germany and separates two districts of the city namely Schwabing and Maxvorstadt. 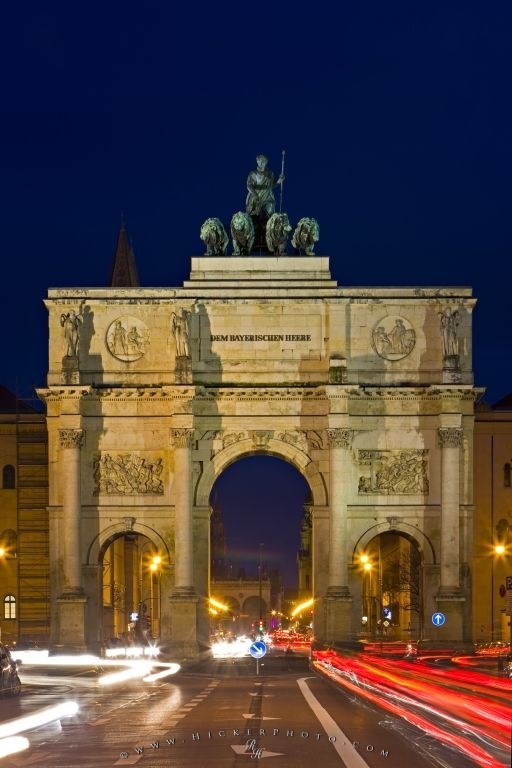 The Victory Gate triumphal arch stands 21 metres high and spans 24 metres wide and is situated at a major intersection in the city of Munich. Centre arch of the Siegestor (Victory Gate) with traffic flowing towards and away from it at dusk in the Schwabing district in the City of Muenchen (Munich), Bavaria, Germany, Europe. Bavaria called the Siegestor or Victory Gate.